Did you know that to have a healthy relationship, you need to follow some essential rules in your relationship to make it the best and strongest it can be. U.S. couples therapist Stan Tatkin, author of Wired for Love, has created these 10 commandments for couples to refer back to whenever they might need some support and inspiration. 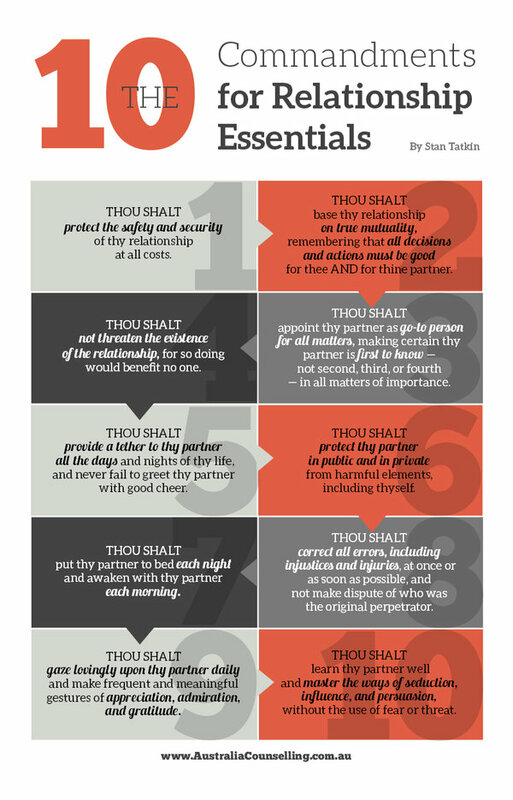 Use the 10 Commandments for Relationship Essentials to guide your marriage or relationship to create a healthy relationship. Healthy relationships are the foundation of physical, emotional and spiritual health. Without a healthy relationship, you’ll find many area of your life will suffer. Use the embed code underneath this image to post this infographic on your own website or blog. If you would like to repost this infographic on your own website, please link back to this page as the original source.